Poroshenko's decree will not be published. President Petro Poroshenko issued on July 26 a decree stripping of Ukrainian citizenship Georgia's ex-president and a former Odesa governor, Mikheil Saakashvili. 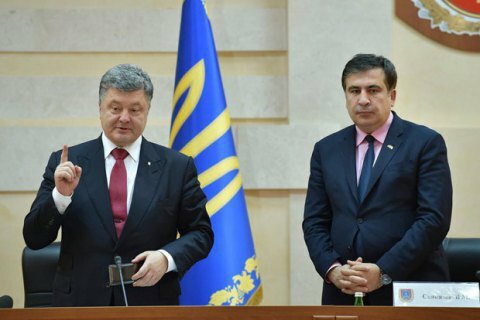 "The Saakashvili materials were provided by the Prosecutor-General's Office of Ukraine, processed by the State Migration Service of Ukraine, sent for consideration to the citizenship commission under the president of Ukraine, and duly considered at a commission meeting. Under the Constitution, the president decides on terminating Ukrainian citizenship based on conclusions of the citizenship commission," the State Migration Service of Ukraine said on Wednesday. "This normative act is not subject to publication, since it contains confidential information, in particular personal data," the presidential press service explained. The decision was made on the basis of Clause 2, Article 19 of the Law On Citizenship, namely - the indication of false data. The documents submitted Saakashvili said he was not under investigation in Ukraine or abroad, but it is known that Saakashvili a Georgian the ex-president in absentia. Former Georgian President Mikheil Saakashvili received a Ukrainian passport at the end of May 2015 so that he could be appointed head of Odessa Regional State Administration in Ukraine. According to the Constitution of Georgia, a citizen of this country cannot have a passport of another state unless his Georgian citizenship is terminated. The Ministry of Justice of Georgia initiated a procedure depriving Saakashvili of Georgian citizenship. President Petro Poroshenko said during a 22 June press conference in Brussels that he did not know what Saakashvili was doing in Ukraine.